Update from my last post in 2013. 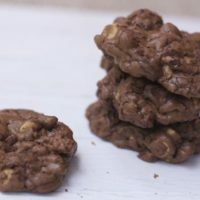 I was craving chocolate as many women do certain times of the month, and I wanted to remake this chocolate cookie recipe Ina Garten. I could not believe I had everything in the pantry so I was up to remake these beauties and take so new photos. 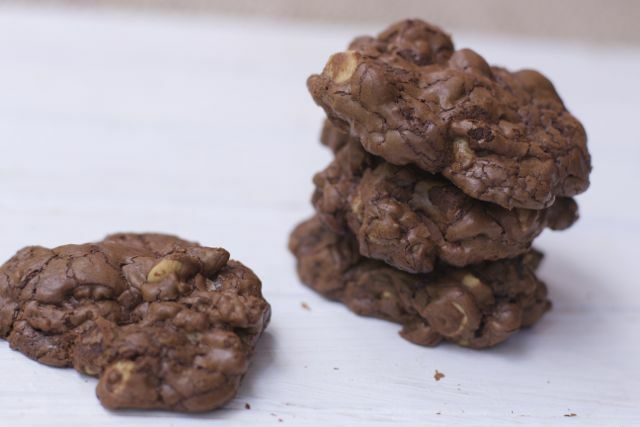 These chocolate cookies are a chocolate version of kitchen sink cookies, filled with 2 types of chocolate, peanut butter chips, pecans and walnuts for the best of all worlds. Let me just say OMG first and get it over with! I just finished reading Chocolate Fever, still have not gotten over this chocolate fix since Hershey Park, but really it was on his summer reading list. Super cute and of course got me thinking of nothing else but Chocolate. 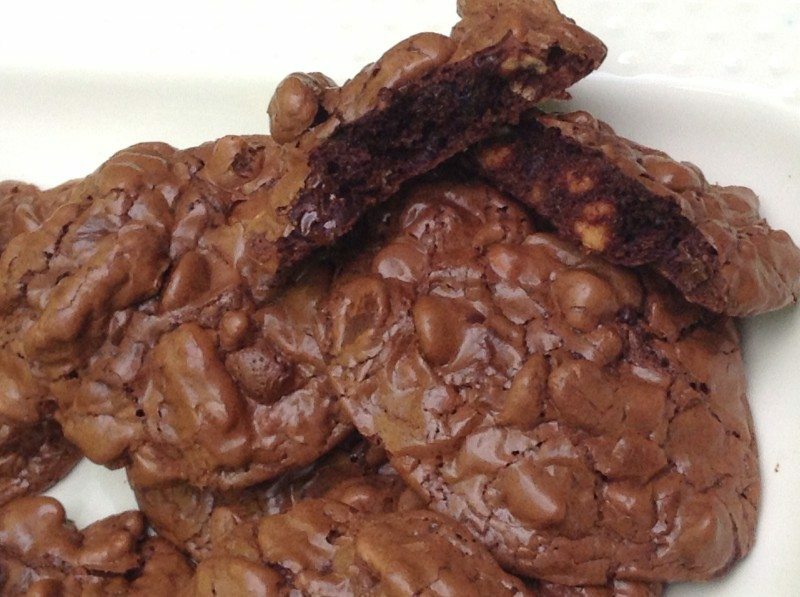 I am forever craving the ultimate chocolate cookie recipe. Trying to stay away from my oven, I could not resist this week’s recipe for Chocolate Chunk Cookies from Ina Garten Barefoot Contessa Cookbook, Foolproof. Out of all the recent recipes I have made by Barefoot Contessa this took longer than expected, especially for a cookie! I did however save time and dishes, by slowly melting the chocolate and butter in the microwave instead of the double boiler. Just be very careful and do not put it on for too long. I initially put them in for 1 minute and then 30 second increments until nice and smooth. With just a little flour in these cookies the flavors come for the fillers. 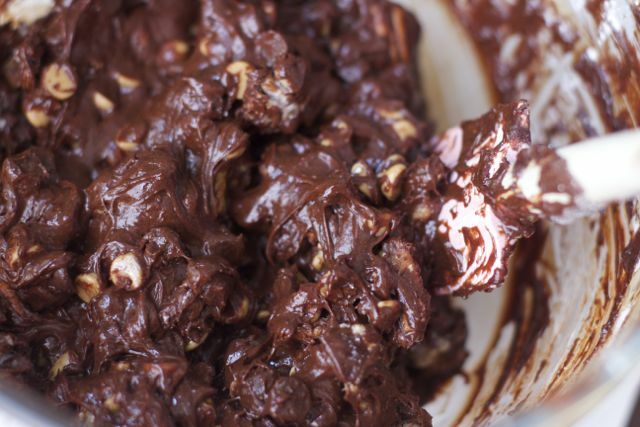 A very dense cookie batter, but use an ice cream scoop for perfect rounds. 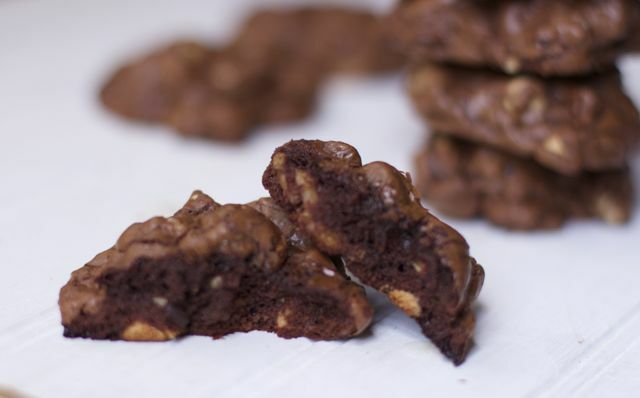 These are like brownie cookies and the perfect serving size to satisfy that chocolate craving. I could have eaten the entire batch. My kids did not like the nuts, at least the first time I made them. Second time, they were 3 years older and gobbled them up. I am not sure what these cookies would have tasted like without the nuts. Personally, I loved the texture of the nuts and the soft chocolate center. They were especially light for such a dense chocolate flavoring. You can try to eat just one, but it is hard. They are best eaten within 2 day s of baking. I am not sure how they would do if I froze them because they are such light in texture. I dropped off a few at a friend’s house and she did not realize there was even peanut butter in them. Next time I may add a few more peanut butter chips but why ruin perfection? I better watch out for chocolate bumps, and love handles! 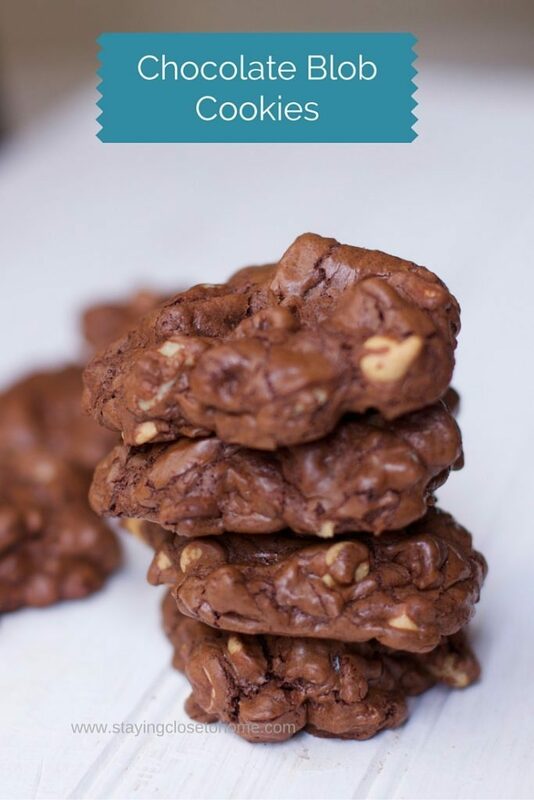 What is your favorite Chocolate Cookie recipe? Preheat oven to 325 degrees. Line two backing sheets with parchment. 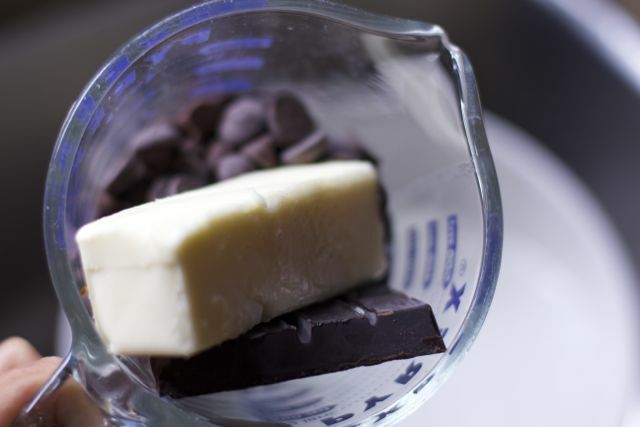 In a bowl set over simmering water, melt butter and 6 oz of the semisweet + all the unsweetened chocolate, until just melted. Let cool for 15 minutes. 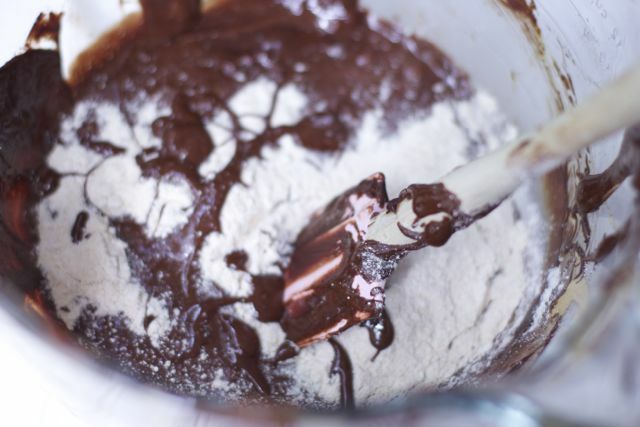 With mixer on low, slowly add the chocolate mixture to the egg mixture. 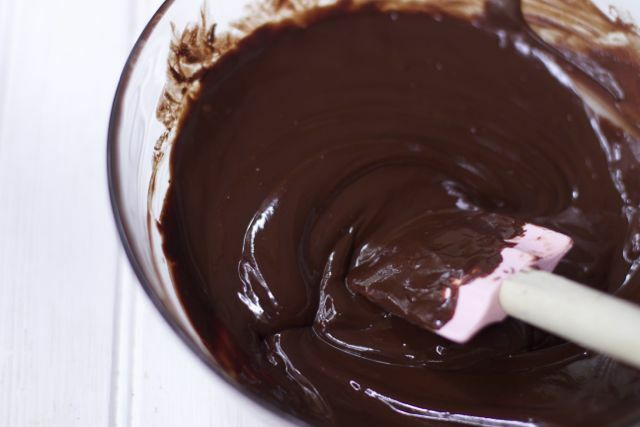 Combine 1/3 c flour, baking powder, and salt in a small bowl and fold it into the chocolate mixture with a rubber spatula. 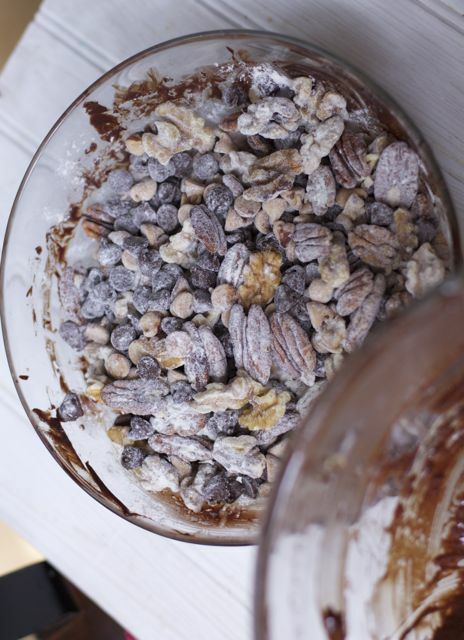 In another bowl, combine the walnuts, pecans, peanut butter and remaining chocolate chips, and 1 TBS flour and fold it into the chocolate mixture. With two soup spoon, drop rounded mounds of batter 1 inch apart onto prepared sheets. Bake 15 minutes exactly. Cool on baking sheets. makes 20-24 large cookies. Cover tightly! Right now Amazon has an amazing sale on Barefoot Contessa Cookbooks A great time to stock up for the holidays or gifts. Now that’s a no joke chocolate cookie! I can see how soft and chewy it is right from the photo. My fave! YUMY!1 My family would devour these. I do love my chocolate and I suppose I could deal with a little peanut butter too. Those sound and look amazing! Definitely bookmarking this recipe to try later on. So excited! Delicious! And I like the name. My kids are big fans of cookies, and I have never met a cookie I didn’t like! Not a homemade one, anyway..
Those look so good! We made peanut butter cookies yesterday and don’t look nearly as good! Oh my – I’ve never mer a chocolate chip cookie that I didn’t like but these look amazing! Peanut butter, chocolate and coffee in the mix? I’m in…. They look yummy! I’ve never made chocolate cookies, I’ve only ever made sugar cookies. I’ll have to add these to my to do list one day, I know my hubby would love them! Oooh those look so GOOD! Perfect! My girlfriends and I do a cookie exchange every year and THIS is going on the list!! OMG…. These look so good. I love Chocolate Chip Cookies the best. I will have to makes these for my family.. Thank you fr sharing.. This looks like a whole pile of awesome sweetness that could just melt in my mouth! Nuts are certainly good protein so these aren’t all bad at all! These look fantastic! I pinned!